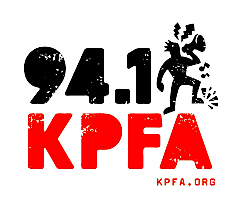 Former Israeli Prime Minister Ehud Barak received an earful from protestors when he was in San Francisco recently to hawk his new book, as explained in this interview by Dennis J. Bernstein. Former Israeli Prime Minister Ehud Barak was on the stomp in San Francisco last weekend to promote his new memoir, My Country, My Life. He was met by a group of highly organized young protesters who were interested in a few facts that the former Israeli PM did not include in his new memoir. 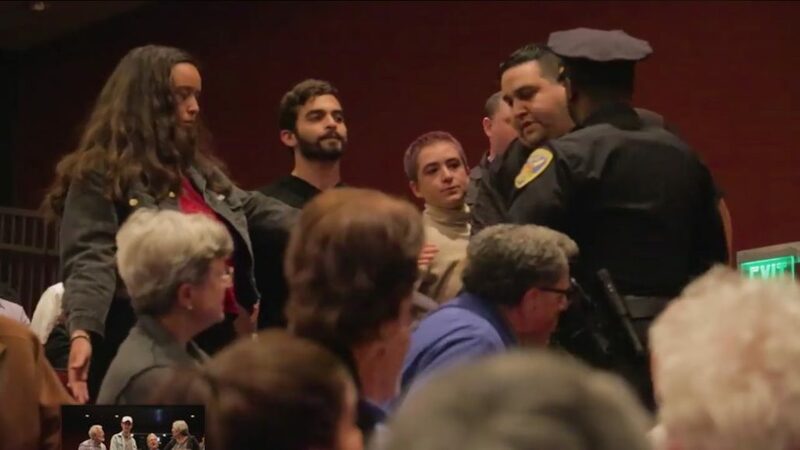 “Ehud Barak gave the order to kill 1,400 Palestinians in Gaza, with 344 children dead,” called out Lauren Holtzman, a member for Jewish Voice for Peace and one of those arrested at the event. “He declared the siege on Gaza, limiting food, medicine and water.” Holtzman was referencing Barak’s responsibility as Israeli Defense Minister for Operation Cast Lead, the Jewish State’s bloody 2008-09 assault on Gaza. In 2010, as prime minister, Barak launched a deadly attack against a group of international human rights activists heading to Gaza on a Freedom Flotilla that was meant to punch a hole in the punishing Israeli maritime blockade, and to bring humanitarian aid to Palestinians. The flotilla was attacked by Israeli Security Forces and 10 of the unarmed human rights advocates were murdered by Israeli military gunfire. The protest was intensified by the recent slaughters in Gaza of unarmed Palestinians. Barak’s San Francisco book promo also came only one day after Nakba Day, the annual commemoration by Palestinians around the world of the violent displacement of 750,000 Palestinians immediately following Israel’s formation on May 15, 1948. The word Nakba means “catastrophe” in Arabic. 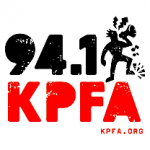 Dennis Bernstein spoke with Lauren Holtzman on KPFA radio on May 17 in Berkeley, Ca. Dennis Bernstein: As former Israeli prime minister Ehud Barak promoted his new memoir at an event at the San Francisco Jewish Community Center (JCC) on Wednesday night. Members of Bay Area Arab, Jewish, LGBTQ and student communities repeatedly stood up to protest, condemning Barak for war crimes committed against the Palestinians. Joining us is one of those young protesters who had the courage to stand up and step forward, Lauren Holtzman. Could you tell us a little bit about what got you there last night? Lauren Holtzman: Together with the Palestine Action Network, we wanted to make it clear that war criminals are not welcome in the Bay Area. Ehud Barak oversaw the massacre of thousands of Palestinians and the killing of unarmed human rights activists, which has led us to the terrible atrocities that Palestinians are facing today. [He called Israel “a great success,” but just on [May 14] alone Israeli forces murdered 62 people for marching, for making their voices heard, for their right to live in dignity and freedom, and for their right to return to their land. DB: Could you describe what happened last night [May 16]? LH: There were hundreds of people protesting outside the JCC. We brought 25 members of Arab, Jewish, LGBT and student communities with us inside the JCC to state that we do not believe that Ehud Barak should be here and that we do not welcome him. Palestinians should be free and should have the right to return. Israel has turned Gaza into the world’s largest open-air prison. They are unable to travel freely, to pursue an education or get medical treatment. Israel controls virtually all entry and exit. The war on the Palestinian people has been widely condemned as a war crime by numerous organizations, in particular Operation Cast Lead under Ehud Barak in 2008-2009. We want to make sure that he is recognized as a war criminal. DB: Eighteen of you were arrested after you shouted down the former Israeli prime minister. Could you describe how that went down? Also, I am very interested to know what went on inside you as you took that very courageous action. LH: Our courage in no way equals the courage of the people in Gaza who stand up for their rights and every day continue to be shot down for peacefully demonstrating. Inside we were met with violent reactions by some for exposing the war crimes that Ehud Barak is responsible for. This could not happen in our name, for those of us who are Jewish, who are Arab, who are queer, for all of us who are part of the Bay Area. It is time for our communities to take a stand for justice, for equality, and for freedom for all people. DB: What was the prime minister’s reaction when you stood up and called him out? LH: As loudly as we could, we named the atrocities for which he was responsible. We said that Palestinians have the right to return. We sang “Which side are you on?” There were people there who did not want to hear what we had to say, but we felt it was so significant what we had to say it. DB: You said that there was a violent reaction. What do you mean? LH: One of the people who stood up was actually hit by one of the audience members. Other audience members tried to mess with people’s hair and pushed us as we stood with our arms to our sides. DB: And you were then arrested? LH: Yes. We weren’t actually told what was happening except that we had to leave. Later we were handcuffed and arrested. But I want to stress why we were there. Both the Israeli government and the Trump administration believe in building walls to restrict the movement of people, racial and religious profiling and trampling on people’s rights. The Trump administration has thrown its full support behind the widely condemned occupation of Palestine. We hope that people at the JCC can see this. If you oppose Trump’s Muslim ban, his border wall, and his other policies, you must also oppose Israel’s military occupation, the apartheid wall and the routine violence against the Palestinian people. 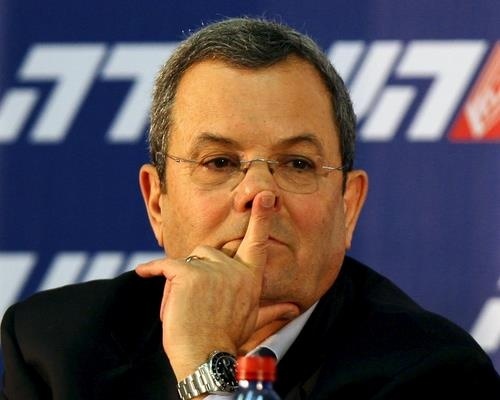 Ehud Barak is a representative of all of that. DB: Why do you feel you needed to step over the line like that and face arrest? LH: Personally, as a Jewish person, I find it horrifying that the JCC, which claims to value justice, would welcome a war criminal responsible for thousands of Palestinian deaths in Gaza. 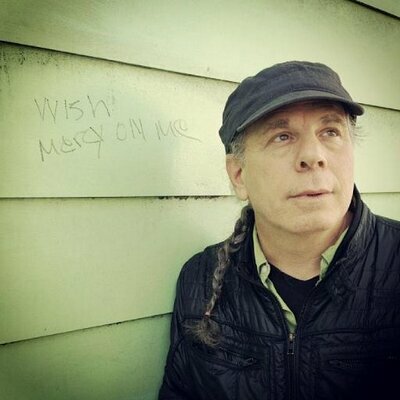 We need to be standing up against colonialism. We have a responsibility in our communities to recognize the crimes of colonialism. Silence is violence.